H.B. Steele & Son wants to be sure that we offer our customers a variety of payment options to suit every family, every need, and every wallet throughout Schuylkill County. With that being said, we have developed several different plans to cater for each individual situation. Retail pricing is applicable for many of our customers who are will-call or automatic delivery. We offer competitive rates that change according to the daily market rates. Retail price customers are not locked into a set price or required to pre-buy their oil for the season, allowing for complete control over when and how often you get deliveries. BONUS OPPORTUNITY: If you order a minimum of 100 gallons, will-call customers can take advantage of a cash discount program of 4¢ off every gallon when paid within ten days of delivery! Keep things predictable with H.B. Steele’s Budget Plan. We predict your yearly usage using calculations based on previous usage, family size, and weather predictions. From that total, we divide by twelve months, giving you one small, consistent, and manageable monthly payment. You also never have to worry about when to order oil as you automatically become a part of our automatic delivery service, delivering you oil when our computers determine your oil level is low. So skip out on those winter months that are not only harsh in terms of weather, but in terms of heating oil needs. Keep your payments even and sensible all year round! In an effort to offer as many options for our customers as possible, we have a number of price protection options that allow for optimal fuel choices for every budget and need. Plans usually run for a six- to seven-month period, locking in an agreed upon price. They are first come first serve, so take advantage today! Pre-Buy: Pre-buy customers purchase all of their heating oil in advance of the start of the heating season at very competitive rates. The plan normally runs from October-April. Pre-Buy Fixed: A fixed price locks you into a set price throughout the heating season, allowing for a consistent, stable price with no surprises. Cap: Our Cap Price Programs offer a way to take control of your home heating bill. These programs give you the benefit of lower oil prices, should they take a downward turn while establishing a ceiling for your pricing. This means your delivery price can NEVER go higher than the capped price per gallon. We strongly recommend one of our cap programs. This is the only way we can assure you receive the lowest price we are offering at the time of your delivery. 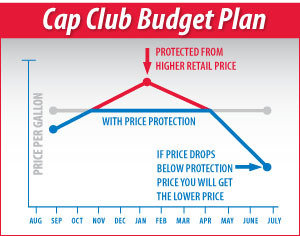 When the retail price drops below the capped price, you will receive the lower price per gallon. You will gain peace of mind, knowing you will never pay over the capped price for the number of gallons purchased. We oﬀer a recurring billing option with which you may use your credit or debit card for automatic payment. This plan also includes the convenience of automatic delivery.